Hey everyone, I was nominated for an award! Read what my daddy wrote about it below and then go vote! 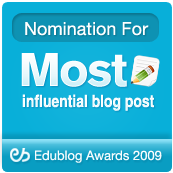 You will notice that there is a Most Influential Blog Post badge lodged in the sidebar here at Intrepid Teacher. Although the post in question was never actually posted here, This, This, That was written my daughter Kaia and me. I have written about the attention the simple post has gotten here. To see how many people have read and responded to this post try googling Kaia Edm 310. Both Kaia and I would appreciate your vote. We are up against some big names in the Edtech world, and it is an honor just to have been nominated, but it would be cool for this already amazing story to be shared with more people. So whether you are a friend, a member of Dr. Strange's class, a member of my network, family, or just a reader of this blog, please go to this site or click on the badge below and vote for This, This, That. Then please RT or share this story on Facebook with as many people as you can.